Ashwem beach, also known as Ashvem beach is one of the best-kept secrets of North Goa. Ashwem beach is Located to the north of the capital city of Panaji, this beach offer delightful ocean vistas fringed by the green fronds of the sway coconut palms that pepper the shore. The tourist season in Goa is from October to March and is at its peak from December to February when the maximum number of visitors flock to the beaches to enjoy the pleasant, sunny weather and calm seas, perfect for swimming and other water activities. During the summer months from March to June, the beaches are still frequented even though the weather is extremely hot. The monsoon season (June to September) is the least popular due to rough seas and dangerous undercurrents as well as inclement weather. 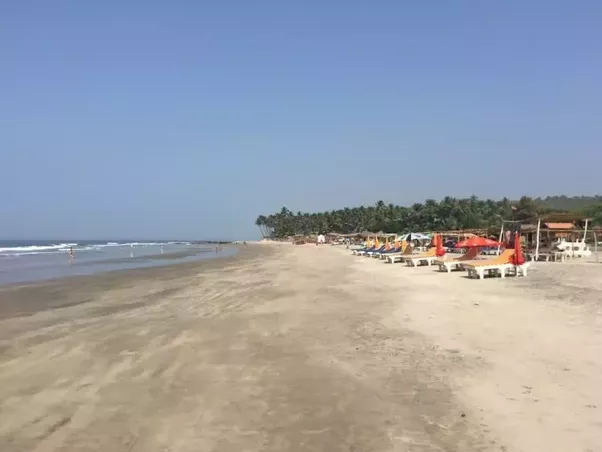 The long, pristine stretch of sand that is Ashvem beach is tucked away from the crowds and is an ideal place for tourists who want a quiet vacation soaking up the sun, sand and surf. The seas around Ashwem beach are perfect for swimming in, and the river that runs nearby offers a safe place for youngsters who are unable to handle the waves of the ocean. You can relax still further by pampering yourself with a spa day at one of the nearby resorts of going for a relaxing Ayurvedic massage. The Ayurvedic massages in this area are known to be of a very high quality and technique. There are a number of beach shacks and resorts that line the shores of the Ashwem and are perfect for a mid-day meal or a stay in the area. The shacks are usually made of coconut palms and bamboo and are known for their excellent and fresh seafood as well as their delicious Goan delicacies. They also serve Continental cuisine for those who prefer milder flavors. The Ashwem beach is known for its beauty and solitude and is not a hub of activity like other, more frequented beaches like Calangute and Baga. Although there are no water sports and other adventure activities available here, if you’re looking for a peaceful day at the beach, surrounded by scenic beauty then Ashwem is the place for you.